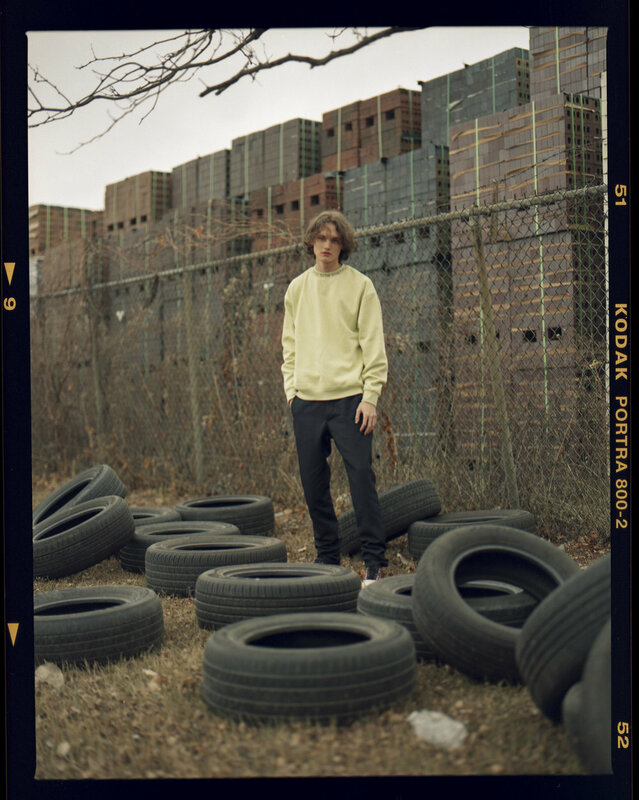 Brendan Carroll is a freelance editorial photographer and also a photographer for Notre, currently based in his hometown, Chicago. Brendan views personality and captures it in the frame with the perceived honest and fierce emotion. His inspiration comes from street photography, ‘an honest portrayal of that exact moment captured in hopes someone else may get joy out of feeling those same emotions’. Brendan’s work ranges from showing the seemingly ordinary daily street life to fashion editorial to the cinematic expression of the story. The mastery is in creating a narrative, a story that only a part of it is lived in the frame. Brendan takes us to a virtual tour of Chicago, telling about some unique places in town. Through his eye we see the film developing lab, a hub for photographers, we visit the family parties from his childhood, walk by some small, cozy diners, finally reaching his Grandma’s house, a location of one of the editorials. Brendan speaks about the challenges a photographer faces on getting commissioned projects, the idea of storytelling in photography, and the smart time investment during winter. Hi Brendan, how did this year start for you? Any new exciting projects? The year has started out very calmly for me. I’m not a cold weather person so whenever the peak of Chicago winter takes over I take time to spend a little less time shooting and more time reflecting on my interests, ideating, and reading. The timing of that always feels right rather than rushing into new projects because the calendar year is changing. Storytelling in photography - what is it for you? And how do you approach building a narrative for the editorial shoot? If I have a lot of time to plan for a particular concept I try to completely envelop myself in it. Storytelling is about noticing all the small intricate details. Photographers and all creatives are often telling the same stories, but those details make each piece of work unique and significant to each story. I reference real life, memories, books, movies, and a lot of my everyday 35mm work to help with my narratives. I try to go into my shoots with a loose list to crack the ice but then improvise and play around to get the majority of my work. How would you describe a creator's’ scene in Chicago, what are the main challenges a young photographer faces? 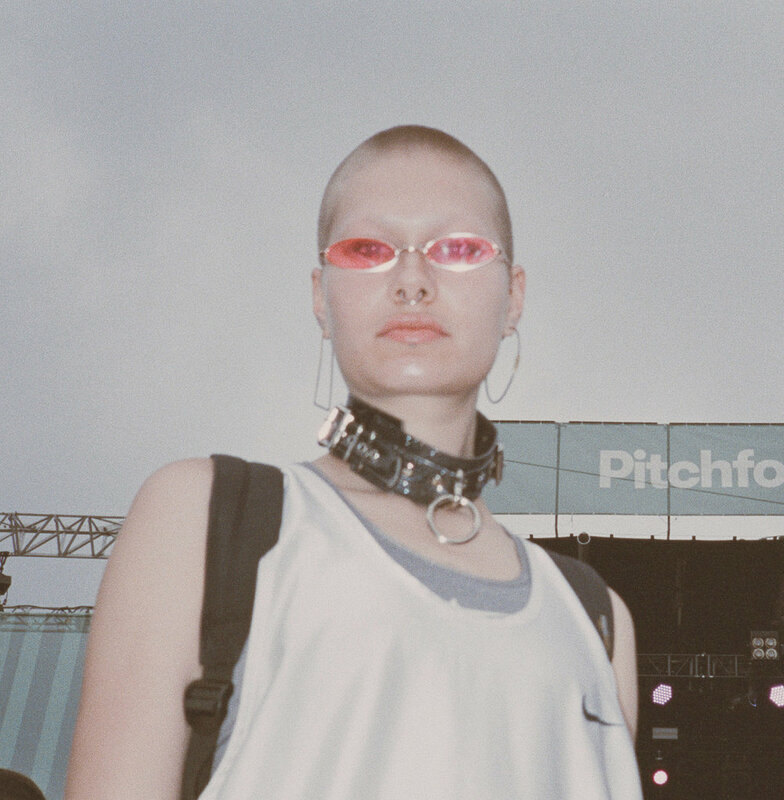 Chicago’s creative scene is vast and thriving. I find new contemporaries and interesting people every week. To have a creative community which motivates and inspires me is important to my work. I’m more of an introverted extrovert, I don’t drink, I don’t really network and don't go out to a lot of events so sometimes building a relationship with other artists can be challenging for me, but the creative energy through sharing each other's work is still strong. The hardest challenge I faced early on was getting paid to create the work I wanted to create. It’s a pretty normal challenge but pivotal as creative to be aware off and not let it get to you. I was shooting all the time creating a lot of work, but none of it really translated to commercial opportunities. At the time the only portraits I was making were candid street shots. I felt like I needed to adapt my work and was starting to second guess the type of photos I was creating to make a living off of photography. For about a month I tried to be a real estate photographer to just to bring in money with my camera, I hated it and stopped. I wasn't confident my personal style of photography would lead to any financial success, but I just kept making masses and masses of photos that I liked, and it led to where I am now. "I try to go into my shoots with a loose list to crack the ice but then improvise and play around to get the majority of my work". "My street work is my instinctual mind that grabs moments for what they are because of how I felt at that time. An honest portrayal of that exact moment captured in hopes someone else may get joy out of feeling those same emotions I did when I snapped the photo". Are there in the city any clubs, underground ventures or agencies one should get familiar with and network to get his name known? I don’t go out to clubs or bars, but there are plenty of sacred photo spots in the city that are important to the scene. CSW, a film developing lab in the west loop is the one place in the city where you can get 35mm and 120mm developed in a little under 4 hours. It’s owned and operated by 67-year-old Oson Chin. The man is a fantastic individual and runs the shop in a real old school way. He has a wealth of knowledge being in the developing business for over 40 years and always has a heartfelt story to share. Upon entering the building it feels like you're walking into a doctors office à la 1996. Old worn shades of tan and brown interiors, big glass windows that shoot shadows of the building address onto the ground, a tight stairway with a big lush 4ft ficus plant center sitting at the bottom and a shaky looking elevator that always seems to be under repair. Because this is the only place to get film done fast, you run into everyone who shoots in the city. From young college kids to old-time clients the entire film community goes through Oson. The place feels very mythological, and we're all bonded together by him. In what way being a Creative Producer and a Marketing Director helps you with your passion for street photography and the fashion world? Are there dots that connect the two worlds for you? I used to do a lot of freelance creative producing and handling social accounts for companies, but now I’m mainly focused on my personal and work I create for Notre Shop Chicago. My street photography is everything for my fashion work. My street work is my instinctual mind that grabs moments for what they are because of how I felt at that time. An honest portrayal of that exact moment captured in hopes someone else may get joy out of feeling those same emotions I did when I snapped the photo. They are everything as a starting point because it’s proof of that feeling. I then revisit the shots that resonate the most with me and build on them for a lot of my editorial work. Shooting on the streets helps me refresh and let ideas come to me instead of forcing concepts or scrolling through the internet for inspiration. I get more out of a walk down Milwaukee Avenue with a stop into a diner than any algorithmic explore page or mood board could ever give me. The world is shifting towards talents reaching success at an earlier age due to the ability to connect with the world through mainstream mediums as Instagram, Pinterest, etc. One needs to go with what he really loves to do and develop his skills in this field which might be against the old society’s norms of finding a job. How do you find your balance? Time is priceless until it isn’t and you have to sacrifice it to pay for rent and food. I don't always do the best job of it but I like to try to spend as much time as I can doing what makes me feel the most fulfilled, and that’s creating images. My drive to keep doing that has been rocky and hasn’t ever felt extremely secure, but I know that the more I do it, the more chances and opportunities I get so I just keep doing that. It definitely feels like an upward climb in the dark up a steep muddy hill but all there is to it is to just keep doing it and things seem to fall in place. How do you see your work develop and what is the next direction you think to experiment with? My work is always developing in my eyes. I’m not exactly where I want to be yet, but I try to find pleasure in the stages of growth over yearning too hard at the finish. I feel like my work has become more focused. I want to start directing films. Think creatively in short vignette moments and have a lot to communicate through motion that can be challenging in only still images. Pursuing film breaking into an entirely new world and it doesn't mean I want to stop taking photos but rather just another creative outlet that serves a new purpose for me. What is the teenage memory that you can say today formed your views and approach to your current aesthetics in photography? When I was in HS, I was in the Radio program. I wanted to be on NPR or BBC radio telling obscure and interesting stories. I think I had this urge because my of my Irish heritage. My entire family is from Ireland so I would go back often as a kid to spend time with my cousins. Whenever we’d have family parties, everyone would gather in a big circle outside the back of my granny’s shed and tell stories, jokes, sing songs, and talk into the night. As an American, I wasn't accustomed to this at parties but loved it and longed to always want to have something to say when it came my time around the circle. Visually I was inspired by the photo books my brother had. I would sneak into his room and look at all his books on 77 punk culture, art, and so on. The combinations of those two things were big into guiding me to the subjects I shoot today. "My Grandma is like my best friend she’s sharper, faster, and has a better memory than I do even at her age, I love that lady". What are the best activities for you to spend time on during weekends? Where can one locate you in the city? I like to eat out at little diners all over the city. My girlfriend Audrey is an artist and illustrator, so she gets the same visual stimulation I do from exploring the city. We are always picking out little, forgotten spots that feel cozy and humble. On the weekends it’s kind of a ritual of ours to eat at our favorite diner and then go to bookstores afterward. Doc Films in Hyde Park is a go-to if I’m looking to get out of the house. Other than that, if it’s nice out, I’ll be walking around and shooting. Your works have a cinematic, underground feel about them. Who are your go-to directors for inspiration? That list could fill up the entire interview, but a few of the greats I look to are Wim Wenders, Stanley Kubrick, Wong Kar-wai, Mike Mills, Jim Jarmusch, David Lynch, Gus Van Sant, Vincent Gallo, Harmony Korine, all the Coppola's, and many more. In the series ‘Colleen’s Room’ Gosha Rubchinskiy x Adidas collection you got this Jesus Eastern Orthodox Icon. Tell about preparing the idea for this shoot. I’d been prepared for this shoot for a long long time. The location for the shoot was in my 94-year-old grandmother’s house. My Grandma is like my best friend she’s sharper, faster, and has a better memory than I do even at her age, I love that lady. I pretty much grew up at her and my Grandpa’s house on the weekends and holidays so that feeling I captured was rather authentic to my family. Everything in that house decor wise is pretty much the same as it’s been since the '60s. When my grandma’s wooden old box set Zenith TV from the ’80s finally burnt out my uncle replaced the tube TV and matched a flat screen to fit inside the big wooden framed box so you wouldn’t know the difference. I have a lot in the works. I’m working on a few different small print zines, I have family based documentation project I’ll start in early spring, and then other client and work for Notre. I’m always revisiting old ideas, taking on new freelance, and staying busy with personal work.